Plus, the legislation that's helping you have a healthy baby. We all appreciate clean, smoke-free air, right? (That's more true than ever during pregnancy.) Well, now it looks like there's even more reason to support smoking bans. Researchers analyzed 11 studies that took place in the U.S. and Europe, involving more than 2.5 million births and nearly 250,000 asthma flare ups. Turns out, hospitalization for preterm births and asthma attacks dropped 10 percent the year after smoke-free legislation was put into effect, according to a review published in The Lancet. These results shouldn't be surprising. The dangers of secondhand smoke exposure during pregnancy are known. (FYI, the risks include an increased risks of spontaneous abortion, stillbirth, preterm birth, low birth weight, and intrauterine growth restriction.) While you hopefully live in a smoke-free household, especially during pregnancy, this review shows that sporadic exposure in public places makes a difference, too. "Even short periods of smoke exposure pose risks," says Aziz Sheikh, MD, Harkness Fellow in Health Care Policy and Practice at Brigham and Women's Hospital, and co-author of the review. What's more, "there's no way to protect yourself from secondhand smoke, other than preventing actual exposure," says Jasper Been, a pediatrician and researcher based in The Netherlands, who also co-authored the review. 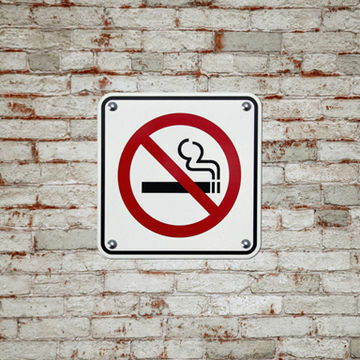 "This is why laws that prohibit smoking in the workplace and public places are so important." If you find yourself in a place where people are smoking, know this: good ventilation and being in a different room won't reduce the risks. You can only minimize your exposure, says Dr. Sheikh. Your plan: Do your best to avoid smoky restaurants, if you live in a state where it's still legal to smoke in eating establishments. And if you're stuck in a social situation where there's smoking (thanks, stubborn Uncle Joe), excuse yourself. Let your companions know you'll catch up with them another time.